The producers of the critically acclaimed new play THE CURIOUS INCIDENT OF THE DOG IN THE NIGHT-TIME have announced that the Broadway production has officially recouped its $4.75 million capitalization, following the week ending January 25, 2015. Written by Simon Stephens, adapted from Mark Haddon's best-selling novel, and directed by Tony Award-winner Marianne Elliott, the play began preview performances on September 20, 2014 and opened to rave reviews on October 5, 2014. The production plays at the Barrymore Theatre (243 West 47th Street). The National Theatre production of The Curious Incident of the Dog in the Night-Time has been named among the Top 10 productions of the year by amNY, Asbury Park Press, Associated Press, Bergen Record, Broadway.com, Broadway Insider, Chicago Tribune, Daily News, Deadline, Entertainment Weekly, Hollywood Reporter, Huffington Post, New York Magazine, New York Post, NY-1, The New York Times, Playbill, Star Ledger, Time Magazine, Time Out New York and Towleroad. THE CURIOUS INCIDENT OF THE DOG IN THE NIGHT-TIME stars Juilliard graduate Alex Sharp in his Broadway debut as Christopher, IanBarford (August: Osage County) as Ed, Helen Carey (London Assurance, Tony nomination and Theatre World Award) as Mrs. Alexander,Francesca Faridany (The 39 Steps) as Siobhan and Enid Graham (The Constant Wife) as Judy. The ensemble includes Jocelyn Bioh (An Octoroon at Soho Rep), Keren Dukes ("Nurse Jackie"), Stephanie Roth Haberle (Artist Descending a Staircase), Mercedes Herrero (The Laramie Project and its sequel), Richard Hollis (Hit-Lit at Queens Theatre), Ben Horner (War Horse), David Manis (War Horse), Tom Patrick Stephens(The New York Idea) and Timothy Wright (The Bridges of Madison County). Taylor Trensch (Matilda the Musical) will play Christopher at certain performances. THE CURIOUS INCIDENT OF THE DOG IN THE NIGHT-TIME transferred to London's West End, following a sold-out run at the National's CottesloeTheatre in 2012. The production received seven 2013 Olivier Awards, including Best New Play and continues to play to sold-out houses at the Gielgud Theatre in London. Fifteen-year old Christopher has an extraordinary brain; he is exceptionally intelligent but ill-equipped to interpret everyday life. When he falls under suspicion for killing his neighbor's dog, he sets out to identify the true culprit, which leads to an earth-shattering discovery and a journey that will change his life forever. The production is designed by three-time Olivier Award-winner Bunny Christie, with lighting by Tony Award-winner Paule Constable, video design by Finn Ross, choreography by Scott Graham and Olivier Award-winner Steven Hoggett for Frantic Assembly, music by Adrian Sutton, sound byIan Dickinson for Autograph and hair and wig design by David Brian Brown. Casting is by Daniel Swee and Cindy Tolan. Mark Haddon's novel The Curious Incident of the Dog in the Night-Time was published in 2003. It was the winner of more than 17 literary awards, including prizes in the US, Japan, Holland and Italy as well as the Whitbread Book of the Year Award in the UK in 2004, and has been translated into 44 languages. 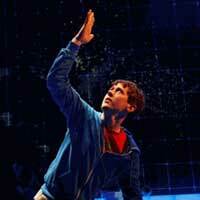 THE CURIOUS INCIDENT OF THE DOG IN THE NIGHT-TIME offers over 50 tickets at $27 for every performance. Tickets are on sale by phone212-239-6200, online at www.Telecharge.com and in person at the Barrymore Theatre box office. Box office hours are Monday through Saturday from 10am to 8pm, Sunday from 12pm to 6pm. American Express is the Preferred Card Partner of THE CURIOUS INCIDENT OF THE DOG IN THE NIGHT-TIME.